Happy 4th of July, dear readers. 1) "So You Think You Can Dance." Where the graceful, athletic and generally smoking hot dancers only look more graceful, more athletic and more smoking hot on my 42" TV. 2) Boxing. Because you haven't lived til you've seen the sweat flying off a boxer's face in high definition, nor can you appreciate pugilism's brutality until you've watched a highly trained cut-man struggle to close a glistening gash in a tight close-up. 3) "Gossip Girl." There are lots of scripted shows that inexplicably improve in high definition, including "Eli Stone," a show I probably would have stopped watching entirely if not for high def. But the opulence of "Gossip Girl" is just made for hi-def, though millions of iTunes using teenyboppers disagree. More thoughts on that, plus quick thoughts maple bats in baseball, after the bump. I've decided to impose a five hot dog Eat-Off for any moment of dispute in my own life. That's how Friday morning's Nathan's Famous International Hot Dog Eating contest ended. For 10 minutes, Kobayashi and Joey Chestnut slummed franks down their gullets and, after the elapsed time was concluded, both master masticators had devoured 59 frankfurters. But they don't believe in ties at this event, thus a lifetime of training had to be distilled to a simple task: Which man was capable of ramming a handful of five squished, water-damped wieners down their throats fastest. In the Eat-Off, the judges ruled that Chestnut had won, but I'm looking at my TV and I'm seeing gigantic hunks of unswallowed, beverage-bloated bun adhered to Chestnut's sweat-covered face. I don't necessarily want to see these details, but my TV gives me no choice. Yes, I could have watched on ESPN's low-def channel, but if Lot's wife taught me anything, it's that you should never look back. Actually, that's what Satchel Paige taught me. Same difference in the long-run. My point? How could Chestnut possibly have been ruled the winner with half of a hot dog still oozing down his jowel? For his part, Kobayashi was slower, but clean. In my mind, he's the true champion, even if that makes me look like a half-hearted patriot. It was a disappointing end to a back-and-forth showdown that nearly rivaled last year's war, even if the announcer whipped out the priceless bon mot, "The passion is raw, but the hot dog is cooked," simultaneously evoking both the Fine Young Cannibals and Claude Levi-Strauss. And really, this whole thing was just an excuse for me to link to last year's blog post on the competition. And speaking of food flying everywhere -- Sepinwall says I could have done a small blog post just on this, but I view my blog more as a collection of essays than just short snippets ... subscribe to my Twitter Feed for the snippets -- what's up with maple bats in baseball? I was watching the Sox-Rays the other night and in the course of nine innings, there were at least three or four shattered maple bats, including one that soared into the stands. Orel Hershiser, whose announcing work I find simultaneously annoying and informative, tells me that younger players like that the weight balance in maple bats are closer to the feel of the aluminum bats they used in high school and college, but they aren't structurally viable. It's getting to the point where every game features one or more situation in which a pitcher or infielder or umpire dodges a shard of sharp splintered wood. 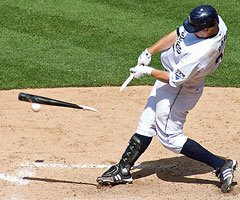 It used to be that a broken bat was a sign of making poor contact with a specific kind of pitch, but now bats just break. And eventually something horrifying is going to happen. Last month ump Brian O'Nora had to go to the hospital to have a cut treated after a bat cut his face. He was OK, but eventually something worse will happen. Baseball responds oddly in these circumstances. In all of my time watching the game, I've seen at least a dozen pitchers get hit in the head by batted balls, but I'd never seen a first or third base coach get hit by a foul ball. Last summer, though, Mike Coolbaugh, a minor league coach was tragically killed by a line drive. Statistically speaking, it was a totally isolated incident, but now you'll notice that major league first and third base coaches have to wear batting helmets like they're John Olerud (one of the greatest pure hitters of my lifetime, but not a Hall of Famer, if you're curious). Why do I get the feeling that Major League Baseball isn't going to act on these shattering maple bats until a shard seriously injures a player or a fan? To me, this is a no-brainer. If baseball players survived just fine for 100 years with bats made of different woods that were more structurally sound and didn't shatter with nearly the same regularity, why not go back to that? I'm not sure how a baseball team is going to avoid a franchise crushing lawsuit when the first fan loses an ear or an eye or worse. Is that what it's going to take to make the change? I always relish your flair for describing the hot dog eating contest. So visceral. Who needs HD when they can read DF? I think one reason that we're seeing more maple bats is that ash -- the stronger, non-splintering wood that has been traditionally used -- is in short supply. Something to do with boring insects that attack only ash trees. CC Sabathia to the Brew Crew!!!!!! Thoughts? Christina - Everybody needs HD. Irene -- It just bugs me that one of MLB's major arguments against just going with aluminum bats -- other than that silly "tradition" thing -- has always been that the speed of the ball off the bat is too high with metal. Well, pitchers *already* get whacked with batted balls. And eventually somebody's gonna get jabbed with a bat chunk. And yes with Prince and CC now on the same team I'm sure the team chef will start producing twice the quantity.